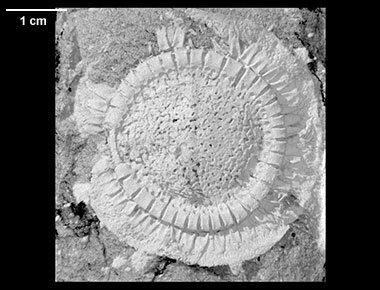 This specimen, from the middle or late Ordovician of Morocco, was purchased at the Tucson Fossil Show on 14 February 2013 by Dr. James Sprinkle of The University of Texas at Austin. It was made available to The University of Texas High-Resolution X-ray CT Facility for scanning by Dr. Sprinkle. Funding for scanning and image processing was provided by a National Science Foundation grant (EAR-1258878) to R. Ketcham, T. Rowe and W. Carlson. The specimen was scanned by Jessie Maisano on 12 March 2014 for a total of 881 slices. Voxel size is 49.0 microns. To cite this page: Dr. James Sprinkle, Mike Reich, Bertrand Lefebvre, Gertrud Rössner and Samuel Zamora, 2017, "Moroccodiscus smithi" (On-line), Digital Morphology. Accessed April 19, 2019 at http://digimorph.org/specimens/Moroccodiscus_smithi/NPL62451/.